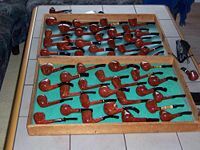 Jørgen Larsen worked for Stanwell from 1965 until 1969, and started making his own line of pipes in 1970. 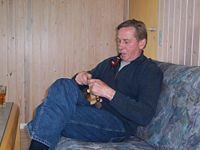 He also made pipes for Peter Stokkebye for about 25 years. 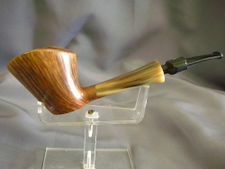 Concurrent with his pipe making, Jørgen was also employed as an officer in an Arrest (jail) for 24 hours a week. An allergy to briar dust has been an ongoing problem during Larsen's pipe making carrier and likely contributed to his decision to sell his pipe making factory in 2005. As of May, 2015 he is 73 years old and no longer making pipes. He and his wife are enjoying life, however, and live throughout the summer months in their home on the Island of Fyn. Jørgen Larsen lives in a village of 600 people, Almind, Denmark - about 5 miles from Kolding, home of another famous Danish pipe maker, Kurt Balleby. Although the two men did not work together, they occasionally shared a bag of Corsican briar. 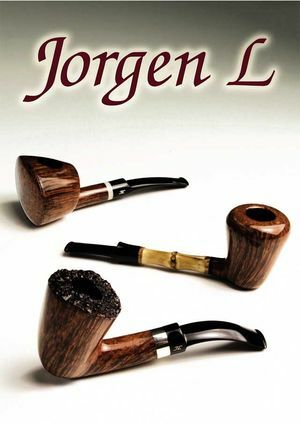 Jørgen's history in pipe making is an interesting one in that, aside from creating one of the first high grade Danish brands (the Jørgen L) and his 30 odd year association with Peter Stokkebye, he was also technical director for both Stanwell and Kriswell (though not at the same time). A slow and resourceful worker, and also having work outside of pipe making, Jørgen crafted only about 100 pipes each year, with 40% of the work he started ending up in his fireplace. While actively engaged in pipe making, Jørgen was one of the few pipe makers that would repair or make a new mouthpieces for his pipes free of charge. The customer had only to pay for mailing one-way, and he payed the return postage. 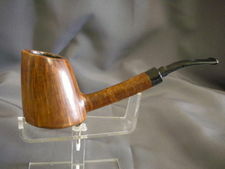 It had been previously report that Jørgen Larsen made Mr. Andersen pipes. 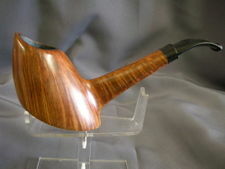 David Field states, "Jorgen Larsen never made Mr. Andersen pipes to my knowledge." See also Jesper of Denmark, which are Classic models designed by Jørgen Larsen. Jørgen L Pipes, courtesy J. Rex Poggenpohl. Rex indicates the pipes above are very representative "Jørgen L" pipes by Jørgen Larsen. This page was last edited on 6 February 2016, at 22:42.